As usual, I’m selling everything at crazy low prices. Just to give you an idea of just how LOW is low, a lot of my preloved items will be sold at 3 for P180, 3 for P350 and 3 for P550. If that’s not enough for you, there are also over 300 concessionaires participating at the bazaar so I’m sure you won’t go home empty handed! 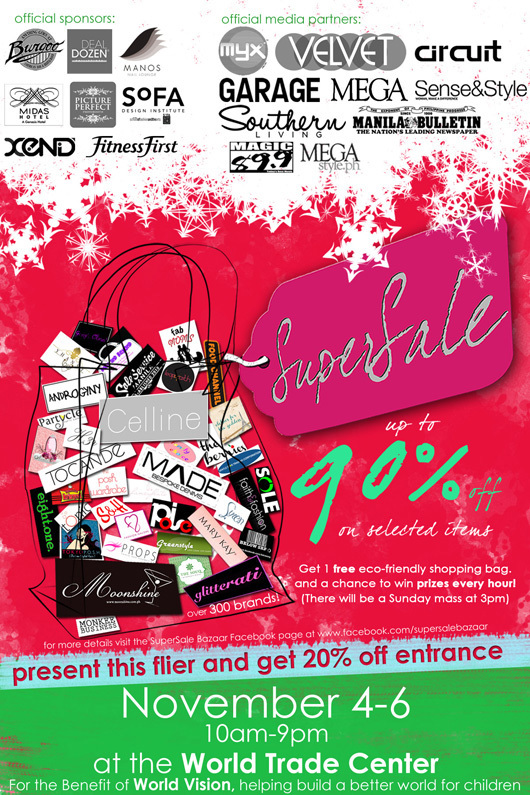 Or simply print out a copy of the 2nd flyer/poster I posted above to get 20% off the entrance fee. P.S. I don’t know my booth number but this might help. Once you enter the venue, go to the 2nd aisle from the right. My booth has bright pink curtains all over so you can’t miss it. They are not organized at all haha!